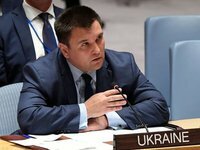 The Black Sea will never belong to Russia, Ukraine's Foreign Minister Pavlo Klimkin has said. "The Black Sea will never belong to Russia. In fact, it will become a Bermuda Triangle for Russia," he said during the 'The Odesa Debate: Uniting Ukraine, the Black Sea Region and the Transatlantic Partners' conference held in Odesa on Friday. According to him, the only option is to oppose Russia from many sides. "We will definitely return Crimea. To do this, we must be strong from the economic point of view and in terms of security ... There is only a comprehensive response to handle Russia… We must do it all together," he said. "Russia blocks our freedom of navigation in the Kerch Strait, the Sea of Azov. It attacks our ships, captures our sailors. Everything we do and must do – should be focused on freeing our prisoners of war, as well as political prisoners and hostages."